Ed convinced me to enter my chili in a chili cook-off, and I immediately got to work on concocting a recipe. After much tweaking and experimentation and a little heartburn, I came up with what I believed to be a very strong contender: chili with a decent thickness, sufficiently spicy but not make-you-cry-spicy, and layered southwestern flavors, both subtle and complex. 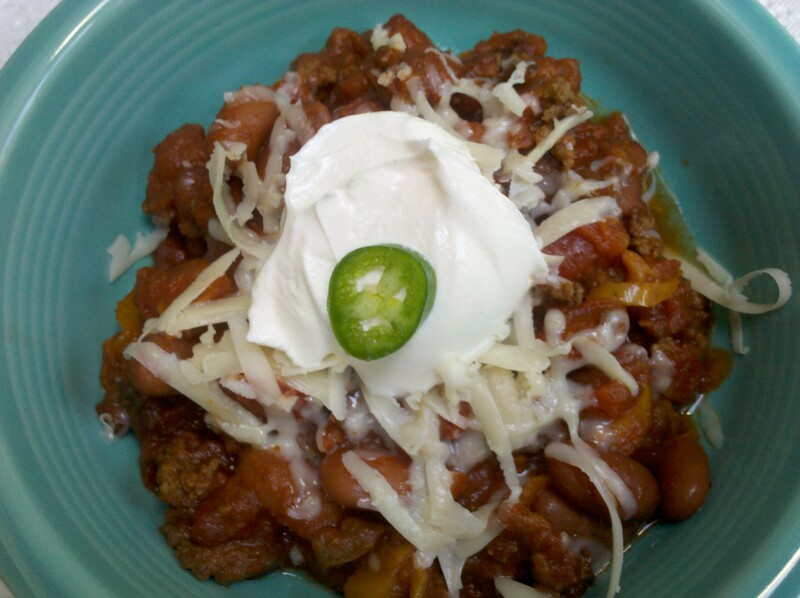 I tried to incorporate the best elements of my favorite chili recipes, and I felt good about my entry. But I didn’t win. I can be a gracious loser if I believe my opponent is truly better than me in the arena. Totally fixed but whatever. I was not a gracious loser. My family, however, gave me their own made up out of pity very sweet People’s Choice Award, since my pot of chili was the most empty out of 20+ pots. That has to count for something, right? For the big competition, I used dried beans because the texture is just immeasurably better than canned. However, for a normal Wednesday night, I have no problem using canned beans. Just be sure to rinse and drain really well. Grated cheese, sour cream, and cornbread are essential partners here. Beer won’t hurt, either. Like most of my recipes, this one isn’t so much of an exact science — more like some loose guidelines. Try it, and who knows? Maybe yours will actually win a real award. In a large dutch oven, brown the ground beef. Do not drain fat. Add chopped onion and yellow pepper and cook about five minutes. Add tomatoes, beer, coffee and all seasonings. Simmer another five minutes. 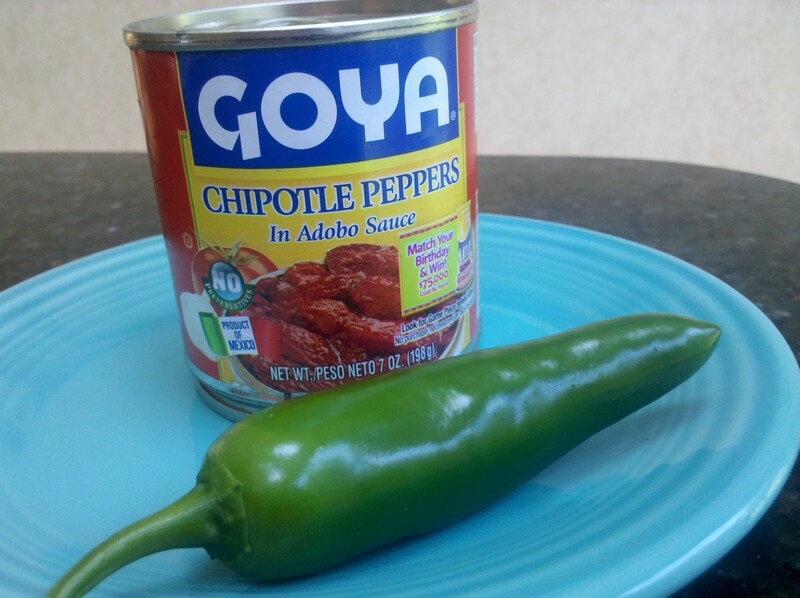 Coarsely chop about 1/4 of the chipotles and add them to the mixture, including the adobo sauce and the chopped jalapeno. Add kidney beans and corn, and cook over very low heat (or in a crockpot) for at least one hour. Serve with grated cheese, sour cream, and cornbread. I first had this chicken at Ed’s nephew’s house during an Eagle’s football game, and I knew right away I would be serving it often. We are lucky to have many of my husband’s relatives close by, so we get to socialize quite a bit. While I am technically “the aunt,” I think of them more as friends than as kinfolk. In addition to being great friends and family, they are fabulous entertainers who give me some of my best ideas. Thanks for this one, Tiff! This is from the June 2006 Cooking Light magazine, and you can certainly serve it as is with outstanding results. 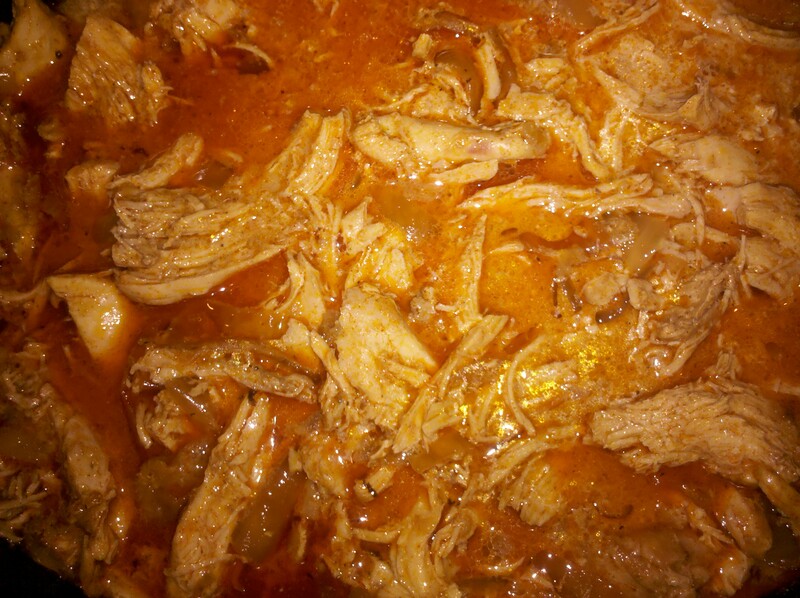 I, however, like to crockpotify almost anything I can get my hands on, so after I post the regular recipe, I will explain how I modify for the crockpot. To prepare chicken, combine first 7 ingredients in a small bowl. 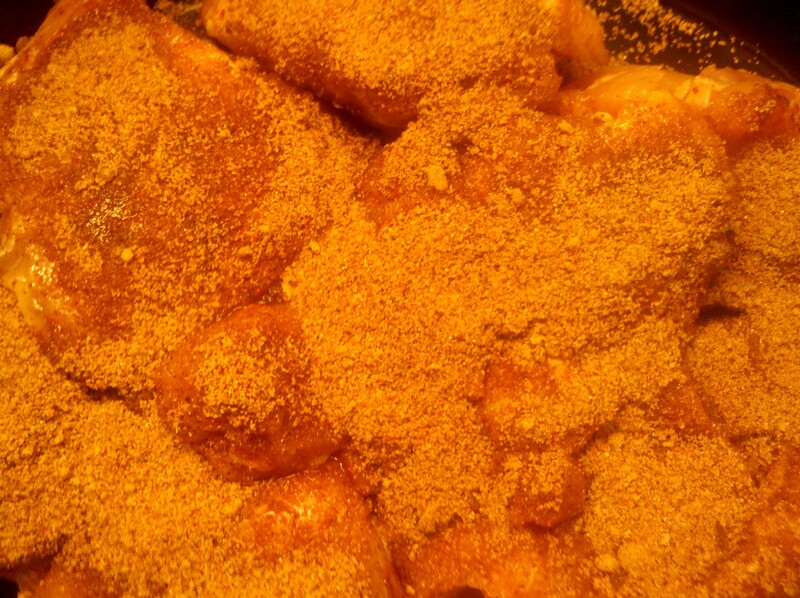 Rub spice mixture evenly over chicken. Place chicken on a grill rack coated with cooking spray; cover and grill 20 minutes or until a thermometer registers 180°, turning occasionally. Let stand for 5 minutes. Shred with 2 forks. To prepare sauce, heat canola oil in a medium saucepan over medium heat. Add onion; cook for 5 minutes or until tender, stirring occasionally. Stir in 2 tablespoons sugar and next 5 ingredients (through pepper); cook 30 seconds. Stir in ketchup, vinegar, and molasses; bring to a boil. Reduce heat, and simmer 10 minutes or until slightly thickened, stirring occasionally. 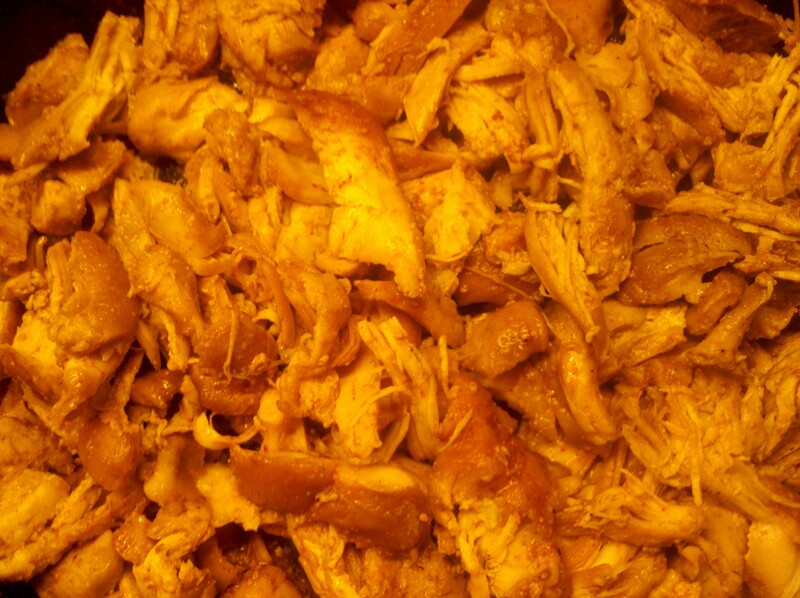 Stir in chicken; cook 2 minutes or until thoroughly heated. Place about 1/3 cup chicken mixture on bottom halves of sandwich rolls; top each serving with 2 pickle chips and top roll half. 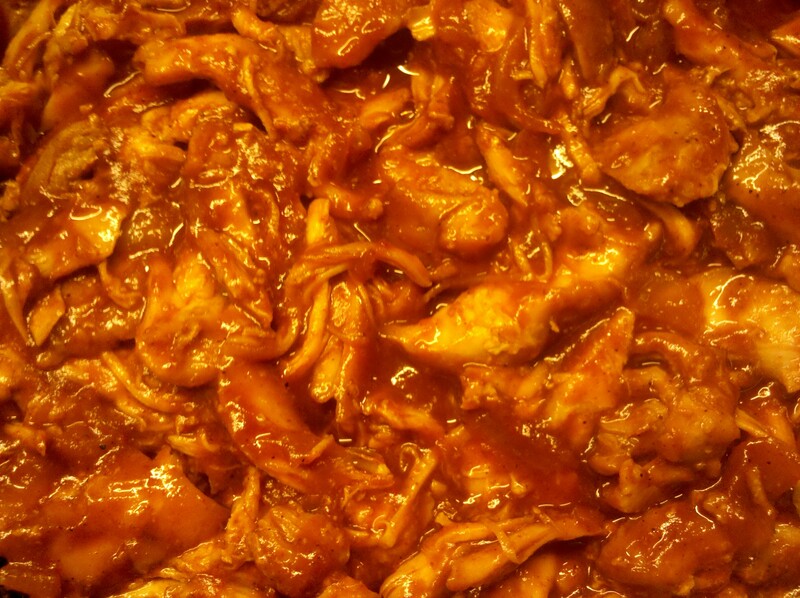 Note: The chicken and sauce can be made up to two days ahead and stored in the refrigerator. 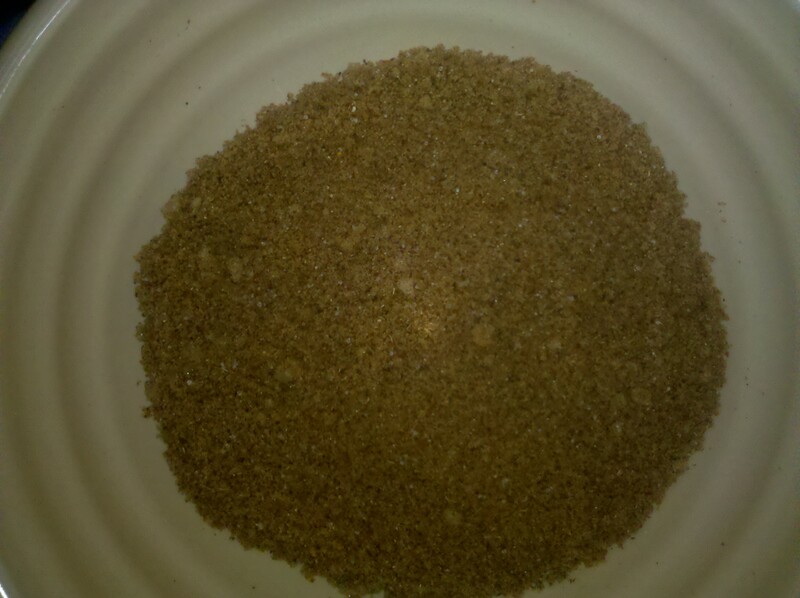 Rub spice mixture above onto both sides chicken thighs and place in crockpot on low. After several hours, chicken will look like this. Don’t be alarmed! You’re almost done! Add the barbecue sauce, and keep on lowest setting until serving. The barbecue sauce is very easy to make and has a great flavor, so I highly suggest giving it a try…but I won’t judge you if you use something from a jar! p.s. I have to apologize for the poor lighting on these pictures. It was a dreary day yesterday, and the natural light was minimal. Looking at them today, they have a bit of a creepy and unappetizing vibe, but trust me, it is a good recipe! This dish represents The Great Marriage Compromise. Ed always had an affinity for heavy ethnic dishes that I would pooh pooh, such as Beef Stroganoff and Turkey Tetrazzini and (shudder) Tuna Casserole. All of those dishes represented bad cafeteria memories from school, and I could not imagine eating them willingly as an adult unless forced to at gunpoint. 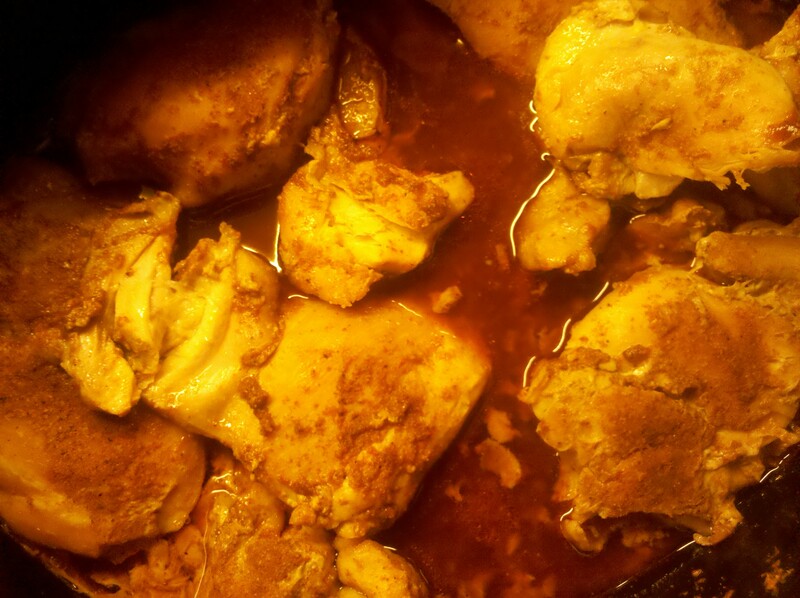 But one day he suggested Chicken Paprikash, and somehow that made it on to my acceptable list. More amazingly, the kids loved it, and it is a much requested family favorite. Despite the fact that there is a major heat wave in the Northeast at the moment, they asked for it again this week. Since it’s a Crockpot meal, the heat isn’t too much of a factor in preparation. Warning: This is NOT a pretty dish, as evidenced below, but it is good old fashioned comfort food. I am serving it tonight with brown rice and green beans from our garden. Stir together onions, ½ teaspoon salt, paprika, cinnamon, sugar and cayenne. Spread in the bottom of Crockpot. Rub garlic over chicken, then sprinkle with salt and pepper. In frying pan over high heat, heat butter and oil. Add chicken and brown, approximately 3 minutes per side. Transfer to Crockpot atop onions. In same unwashed frying pan over high heat, bring stock to simmer, scraping up brown bits. Pour over chicken and cover. Cook on low five to six hours. 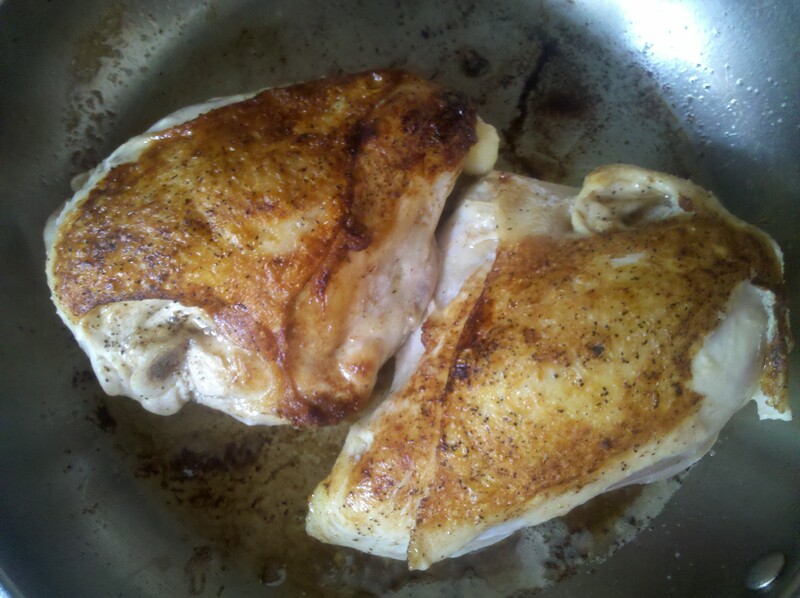 About 30 minutes before serving, remove chicken from bone in large pieces and return to pot. Stir in sour cream right before serving. Serve over rice.